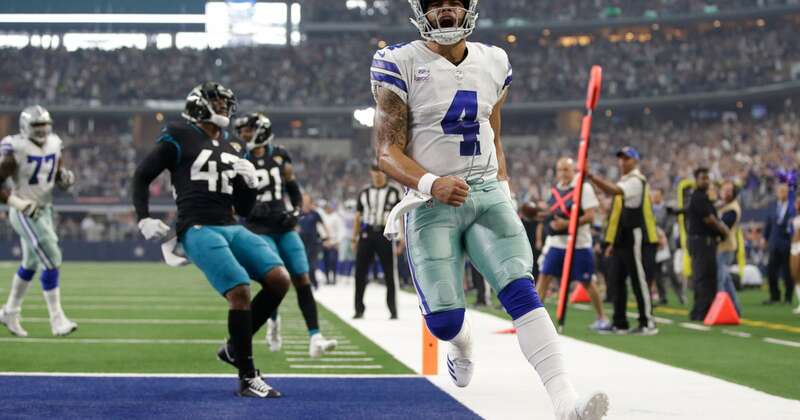 Prescott threw two touchdown passes to Cole Beasley for a big halftime lead and rushed for a career-high 82 yards with another score in the Cowboys‘ 40-7 victory over the Jacksonville Jaguars on Sunday. But the Cowboys answered with their second interception of the season, by Jeff Heath as part of triple coverage , and Jourdan Lewis‘ recovery just barely inbounds of receiver Keelan Cole‘s fumble after a catch. The Jaguars had season lows with 204 total yards and 65 on the ground. Dallas’ Brett Maher had four field goals for the second time in three games, including a career long of 55 yards. … Randy Gregory had his first sack since his return from substance-abuse suspensions that sidelined the Cowboys defensive end for 30 of 32 games the previous two seasons. Jaguars: DE Calais Campbell left in the first half with a rib injury. … TE Niles Paul didn’t return because of a knee injury.